Great example of a balaclava in full use. While many people just refer to them as ski masks, not bothering to note the differences that make balaclavas what they are, this specialty winter wear has an interesting history, as it’s name would suggest. The top gear for winter weather use, able to keep your head and face extremely warm (at least when you stay with the top picks like the ones on this list), and give you the warmth you need to make the most of your winter adventures. 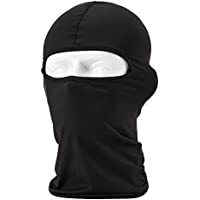 Because of the design it’s also worth noting that a good balaclava also protects the neck and can be tucked into a sweatshirt to create that solid seal that keeps in the body heat and keeps out wind, snow, and cold. This is a great design that goes way above and beyond what you can expect from a basic ski mask or winter stocking cap. N-Ferno Thermal Fleece Hinged Balaclava Absolute top of the line balaclava on the market. Self Pro Windproof Balaclava & Ski Mask Outstanding thermal balaclava with exceptional reputation. Tough Headwear Windproof Ski Mask Balaclava Third member of the clear top 3 trifecta. 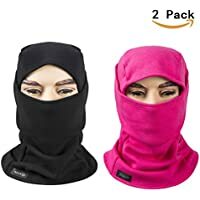 Redess Fleece-Lined Balaclava (2-pack) Very nice 2-pack for couples ready to become winter warriors. N-Ferno Thermal Balaclava w/ Heat Exchanger 2nd well deserved entry by N-Ferno on this list. Oldelf Tactical Heavyweight Balaclava Outdoor Sports Mask Very traditional looking high quality balaclava. Lycra Fabrics Ski Face Mask Inexpensive basic balaclava option. The Friendly Swede Nordic Balaclava Face Mask Outstanding design with exceptional customer service. Miracu Lightweight Balaclava Highly rated balaclava doubling down on winter use. There are many truly outstanding options out there when it comes to finding the right balaclava on a cold winter day, but the thermal fleece balaclava from N-Ferno is a step above the rest. This thermal fleece head covering with its wind resistant design means you don’t have to worry about the biting cut of the wind and you can keep your face mostly protected from frostbite. Add in some ski goggles if you’ll be hitting the slopes and you have an amazing combination here. This piece of winter headgear not only looks good and is available in three colors (black, yellow, and gray). 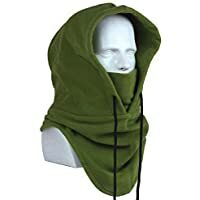 In fact, N-Ferno has such a great reputation for the warmth and protective qualities of their balaclavas that these aren’t just used by snowboarders, skiers, and other winter outdoor enthusiasts but also for hunters, ATV riders, and even some motorcyclists. In any situation where a really good piece of warm headgear saving from wind, cold, or mud splatter is a big deal and you want a good pair of goggles and safety glasses to still be an option (or a helmet over top) then the N-Ferno balaclava is an outstanding choice. There’s a lifetime warranty backing the quality of manufacturing, although this does not cover wear and tear over the years, but ensures the quality of the original production and with literally thousands of high ratings from actual buyers and active outdoorsman, it’s hard to argue with any other balaclava as being the king of this top rated list. Self Pro has a big name to live up to, and they do a great job living up to that name with their windproof balaclava & ski mask. Offering strong protection from cold, wind, UV rays, and even dust and particles blown by the wind, this is a unisex design that is designed to offer the absolute best outdoor experience. This balaclava keeps you warm and wicks away sweat while remaining breathable. Soft, comfortable, and warm, this hits the entire checklist when it comes to everything you want in a truly good outdoor mask. 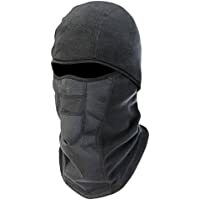 Even more encouraging is that this balaclava has improved over time because the company has done extensive outreach to customers and outdoor specialists to get their feedback, find out what’s working, and also what needs improvement. This feedback has been used to improve the 2018 design and that means a longer neck, even better coverage, and a versatility that you won’t find with many other balaclavas as these can be worn in a wide variety of different styles. The fabric is hypo-allergenic, stretchable, and wins big points for being very comfortable in addition to useful for a wide variety of outdoor activities. Add in the 100% cash back guarantee and its easy to see why this product is right at the top of our list of the best full use balaclavas out there! This ski mask from Tough Headwear offers outstanding protection from cold, UV rays, wind, and even dust. Using the well-thought out and tried & true balaclava design, this company brags about offering the ultimate in comfort and protection, and they can back it up. When combined with a great pair of protective goggles, these can be used for a variety of outdoor activities whether hitting the slopes in the middle of winter, protecting yourself from blowback when using a snowblower on a windy, but snowy, day, or these are thin enough to be part of ideal protection underneath the helmet or with goggles on to keep sand out of the eyes and minimize how much gets into your clothes. This balaclava fits well, breathes, and can keep in warmth in the winter while wicking away moisture like sweat from your body. That versatility allows for four season use, and there are not many pieces of great outdoor athletic gear that can claim that level of usefulness regardless of the season or activity. Add in a solid lifetime warranty, and there’s a reason this brand rounds out a clear trifecta of the really outstanding balaclavas currently available to consumers. Receiving thousands of perfect ratings from customers, there’s a lot to love about what they bring to the table. Redess fleece-lined balaclavas are a windproof and warm design focused heavily on adding warmth as a full cover ski mask. Comfortable, made of materials that are soft & easy on the skin, there’s a lot to like about these pieces of winter clothing. Only a small part of your face is exposed, giving you clear lines of sight, and these can easily be paired up with a pair of protective shades or goggles to get the full amount of protection you need whether skiing, snowboarding, snowmobiling, or simply taking it slow while snowshoeing, winter hiking, or even waiting patiently in a deer stand for that perfect buck to come along. The interior is made of velvet so you can enjoy extra softness and comfort. Add in an extremely light weight and a company backed 100% money back guarantee if you’re not satisfied with the results. This is a one size fits all product and among the many reviews you find online for this remarkably soft and fluffy head cover particularly mention the excellent value for the cost. That’s excellent praise and it’s hard to believe that they are going to slip at all. This is a winning product and as long as the focus on quality continues, it’s going to stay that way. N-Ferno appears again because they make some very high quality outdoor products and this black balaclava (model 6970) is built with warmth in mind, with a heat exchanger built right into the face mask to help keep you warm and breathing comfortably even in extreme cold. 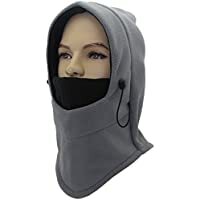 There’s a difference between just the normal cold of winter and then having to deal with extreme winter conditions, and this N-Ferno balaclava with an adjustable face mask can be removed easily, if need be (although some individuals with very large beards have reported having a hard time making the fit work with the hook and loop straps, FYI). The material is designed to be stretchable to allow for a better fit, and the heat exchanger is there to help nullify the damaging effects that Arctic level cold air can cause. Let your face stay dry and warm. Add in some solid winter liners and the use of really top notch fabrics and materials and it becomes easy to see why so many outdoor enthusiasts love this option. While the majority of reviews are positive, it is worth noting that there are some detractors to this particular model, especially when it comes to frustrations with the heat exchanger and making the adjustable face mask work for you. All in all a very solid choice from a trusted brand. Appearing more traditional at first glance, the Oldelf balaclava is made from a heavy fleece and offers a traditional style that might make it look a bit bulkier and older than many modern designs, but it absolutely gets the job done with modern material and design to make sure you stay warm and comfortable, whatever the outdoor conditions might be. Available in five different colors (black, blue, gray, army green, & red), this classic style feels incredibly soft and comfortable, breathes well, and is extremely versatile in design. Able to be worn as a mask, a scarf, a hat, a bandanna, and everything in between, if you are an outdoor fanatic who doesn’t allow cold weather to keep you inside, then this is going to be a quality purchase that helps keep you warm and active even in the cold. There are some people who have a hard time with fit, especially with smaller or slight builds, but this is a minor complaint and often is also about preference of the tightness of fit and material. This is an exceptional example of a conventional balaclava design and it will serve most winter warriors well! A very basic and simply designed balaclava, if you are looking for an inexpensive bit of facial protection that is especially good for autumn or cool spring days, then this one by Lycra Fabrics is going to be a great starter option that will provide fairly solid protection without busting your budget. 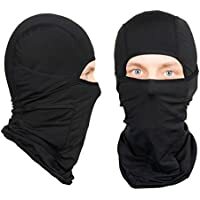 Available in 5 different colors (red, yellow, dark gray, black, and blue), these balaclavas focus on being soft, light, and yet maintaining the same level of durability, breathability, and warmth that you would expect from this type of product. Advertised as being very soft and wrinkle free, these will help you stay dry, which in turn will really help you stay warm. 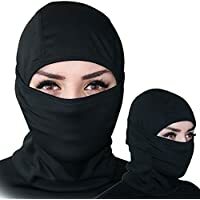 They are machine washable, unlike many others, and have the same multi-purpose versatility that balaclavas are truly renowned for. 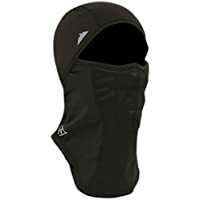 Suitable for a wide array of different sports and outdoor activities, there’s little question that a good balaclava can make a major difference in comfort not only for the face but also your head and neck because of the quality design and construction, and this is a great budget choice. While rated as one size fits all, if you have a particularly large head or neck the fit can be tight and harder to make comfortable compared to some of the higher rated items on this list, but as stated before, a good inexpensive beginner option for your average sized outdoor enthusiast. The Friendly Swede is a name that might not get a lot of recognition with many in the States, but there is a reason they have a reputation among many serious winter sports fans, and this 2-pack of high quality balaclavas definitely holds up to that reputation! This is a warm multi-functional balaclava that has consistently received very high ratings among many of the customers who have ordered before testing these out on their own version of a winter adventure. Whether used as a liner under a motorcycle helmet, as a ski mask, or another layer for warmth during a winter hike, there’s a lot to love about what the Friendly Swede’s entry into this market brings to the table. This particular design is known for having quite a long neck, making sure that even taller individuals or those with larger necks and heads can get a good fit that covers their neck and any excess cloth can be tucked into a shirt collar, cutting off the cold winter air from sneaking in anywhere. That’s a pretty positive design choice, and this model is 93% polyester with the other 7% mix being spandex. In addition to this, The Friendly Swede is renowned for their top notch customer service and their products are covered with a lifetime warranty. Built specifically for winter use and for warmth, the extra reinforced balaclava by Miracu makes no apologies for what it is, trading in most summer and warm season use suitability to create a truly warm and comfortable cover for when winter weather strikes. 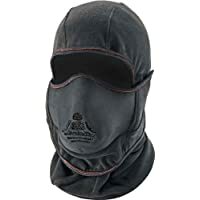 Available in three color combinations (Gray-Black, Black-Gray, and Rose-Red), this balaclava and ski mask is made of fleece and is both soft and comfortable while working to keep you warm and do its job so you can enjoy everything winter has to offer. While this might not be quite as versatile as some of the other options here, the ratings tend to be very high because there is no confusion about the use of this particular balaclava: it is to keep you very warm during the winter months and there is no concern here for summer paintball games or spring ATV four-wheeling. This is an extremely warm and high quality balaclava that will get the job done during the winter, and is definitely an excellent option if you don’t care about 4-season versatility but want to be doubly reinforced for dryness and warmth in the winter. There’s a reason that the really high end ski masks all seem to follow the Balaclava style of headgear. These are very protective of sensitive skin areas on the face that are often exposed in cold weather, and they still allow for quality goggles on the outside so you can enjoy full line of sight in addition to the additional warmth and protection that these fine pieces of headgear bring to the table. While a stocking cap or a scarf can be better than nothing, a good fitting balaclava brings the benefit of both, plus if long enough the ends can be tucked into a sweater or shirt before putting a coat on over top, and that means sealing in your body heat and cutting out the exposed skin that cold and snow could get into. Those benefits can make a huge difference, and prove a bonus that goes above and beyond what a scarf and stocking cap individually can provide. In many ways, this is a perfect piece of winter gear. However, there is an obvious use for the balaclava that also has created somewhat of a negative reputation for them, and in some places you will need to check on local ordinances or laws to make sure these are allowed. Because they do cover the face and hide identity, they have been used by thieves or criminals in the past. This is the same reason that SWAT and specialty police often use these as part of their uniform, to successfully hide the identity for their protection. This does create a bit of an underlying reputation for these pieces of headgear, and obviously as cool as a tactical police officer looks – be smart about these. Use them out on the slope. Don’t use them to stay warm and rush into a gas station or convenience store (I’m speaking from experience – this happened to me 40 minutes after being assaulted while on the job – the last thing I wanted to see was someone in a face covering balaclava practically drop kick the door in because they need their caffeine right now – instant PTSD there). Use them correctly – use them for outdoor sports. While balaclavas are used for covering faces or for winter gear nowadays, they actually have a very interesting history and are named after a battle during the Crimean War: the Battle of Balaclava (this is the famous battle the famed Lord Alfred Tennyson’s poem The Charge of the Light Brigade is based on – text found HERE). The British forces did not have proper gear for cold weather, but noticed the headgear used by locals in the area, including the village of Balaclava where the battle would take place. Known as Uhlan caps or Templar caps in the 1800s, eventually the name of the town would become synonymous with these types of caps and they would gain popularity well after the war was over. When balaclava became the “official” name for this type of headgear is hard to say though it didn’t consistently appear until well after the war, in the 1880s. Certainly an interesting bit of history for a piece of outdoor gear that has become a huge winner among the winter warriors among us. These heavy duty ski masks have a pretty incredible history. After all, it’s not often that the worldwide spread of a popular piece of outdoor equipment comes from the Crimean War, but for mot of us today this is all about getting the best winter gear that will help you keep warm, and in this case that definitely means the ski mask with the distinctly Russian name.